I've rarely been asked to write a book review. Used to sharing titles I've come across and truly enjoyed, it always comes as a surprise when a writer seeks my thoughts about his/her book. Lance McCulloch brought such a surprise when asking if I might find some time to review his title, The Colors of Blue. I didn't make any promises of when I would get around to reading the book but, after taking one look at the beautiful cover and reading the synopsis, I knew it was a title I would buy and read as soon as I found the time. 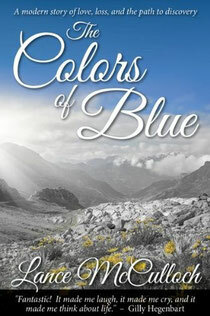 The Colors of Blue is an enchanting story set in Colorado, primarily The Tres Piedras Ranch. The scenic descriptions flow well and more than once I found myself wishing I could transport myself to such a place so I could see and feel things for myself. I desperately wanted this place to be real instead of a figment of a writer's imagination. The main thing I will touch on in this review, however, is the well-rounded characterization McCulloch provides, especially since there are so many types of relationships touched upon within the pages of The Colors of Blue. First, we catch a glimpse of a woman (Sarah) who becomes disenchanted with her relationship, especially after she discovers her boyfriend whom she lives with is cheating on her. She moves out and begins to rebuild her life in spite of the challenges she faces. Another relationship involves Sarah's sister, a woman who is marrying the man of her dreams. This is where the setting of the story comes into play since all members of the wedding party are invited to the Tres Piedras for a week as part of a pre-wedding gift to the bride and groom. Sarah is invited to the ranch and life takes on a new meaning as soon as she sets foot on the grounds. She meets Huff, which introduces us to yet another relationship. Huff and Sarah develop a bond, perhaps like that of a man in the presence of a woman he wishes he could claim as his daughter. Through Huff, we are introduced to the long-standing marriage to his wife, Maria, and the bond they share is obvious in the stories he shares with Sarah. Later, we meet this dynamic lady in person who shares something with Sarah which few people would understand. This unique common ground results in yet another relationship which McCulloch explores in The Colors of Blue. I can imagine that Sarah will always be in touch with Huff and Maria, regardless of where she lives. As with anything in life, there is conflict. Just when Sarah begins to open her heart to another, her cheating ex - also an invited guest at the Tres Piedras - decides to stir up trouble in what could turn out to be Sarah's paradise. There were a few times I felt like wringing his neck, as well as one other, but that just proves how much I was vested in the story. It was engaging from beginning to end and I'll definitely read future titles by Lance McCulloch. Imagine my surprise when reading the author's note at the back of the book to realize that the ranch really exists and that the author is co-owner. I definitely hope to visit the place when in Colorado sometime in the next few years. If you would like to get a visual of the ranch, you can see a few photos by visiting The Tres Piedras Ranch, a page McCulloch has published on his website, The Colors of Blue. If you would like to learn more about this book, click the book cover and you will be taken to the book's page on Amazon.